“Before committing to a franchise, find out where you’ll get the most bang for your buck. What do you really get in return for your franchise fees? Buying power and national advertising are certainly beneficial. But the one thing that I see missing in a lot of franchises — especially the smaller ones that you don’t see on TV — is benchmarking. For example, McDonald’s has one of the best benchmarking systems out there. As an owner, you receive reports throughout the year that show how your location performs compared to others in your geographic region based on your size and revenue. That information is critical. Our firm has access to several franchise databases, so we can create internal benchmarking reports for our clients to track and measure efficiency and profitability. Ultimately, the benefits of franchising may depend on your personal experience as a business owner. If you’re new to the game, a franchise may make your life easier by providing you with processes and procedures for day-to-day management. But seasoned business owners may not need that guidance, so they should carefully weigh the added expense of start-up costs and perpetual royalty fees. When you consider going into business for yourself, you have three basic choices: Start from scratch, buy an existing business, or look for opportunities to purchase a franchise. 1. How many franchises does the organization have? A large number of franchises may indicate a successful, well-run established business. If so, that's a good sign, but be careful not to locate too near another of the same franchise. 2. How much is the franchise fee? A blue-chip national chain may cost significantly more than most others. 3. What are the royalty fees? The average seems to be between three and six percent. 4. How much help can you expect from the franchisors? Will they help with site selection, licensing and hiring? 5. Is the franchise legitimate? If you're not certain, check with the Better Business Bureau or the Federal Trade Commission. Deciding to go full ahead with a franchise is a difficult and challenging task. 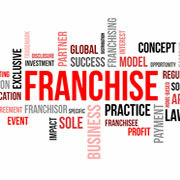 Take a look at the Federal Trade Commission's booklet on franchising and then carefully discuss the issues with your professional advisers. As with any investment, the more you know, the better prepared you are to make a go of it.